Learned about this dog park thanks to a tip on Reddit. The dog park is located at one end of Wescott Park in North Charleston. Enter the park, hang a left when you see the giant baseballs, and go all the way to the end. There’s a pretty good sized parking lot next to the dog park. The dog park consists of a large dog section and a small dog section. Each section has its own entrance, and a gate allows passage between the two sections. 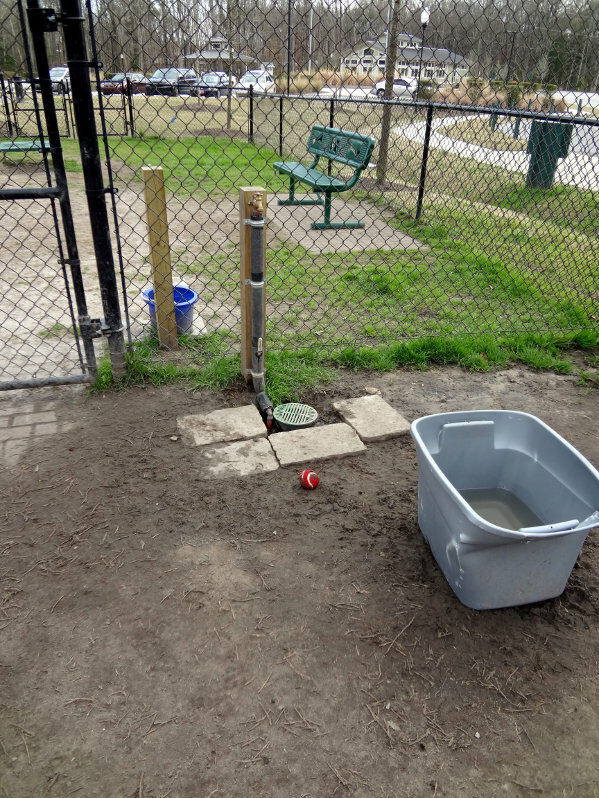 There’s a water spigot located in the corner of the dog park next to the large dog entrance, but no doggy water fountain inside. There is one just outside the dog park by the small dog entrance though. Buckets placed around the park allow dogs to get water when they’re thirsty. One nice thing about the dog park is that in both sections are some dog agility type things: platform, ramp, big tunnel, hoops and a jump. This is a pretty nice dog park, and when you’re done you can wander the paths that run around the park, and maybe check out some baseball games. Wescott Park is open from 9AM to 9PM. Here’s the dog park on Google Maps.